Ned Germanson, son of Tom and Elsbeth Germanson on April 16, 2019. Visitation at Prince of Peace on April 23 from 10am-11am; Funeral Mass follows at 11 am. Ruth Zeisler, mother of Susan Pretnar, on April 8, 2019. Visitation at Prince of Peace on April 13, 2019 from 2:30pm - 3pm. Funeral Mass at 3pm in the day chapel. Dixie Boyd, mother of Mary Alice Kline, on April 7, 2019. Visitation at Prince of Peace on April 17, 2019 from 10am-11am followed by funeral Mass at 11 am in the day chapel. John Sazera, husband of Sheila Sazera on April 2, 2019. Visitation at Prince of Peace on April 5 from 10am-11am followed by funeral Mass at 11am. Robert Smith, father of Matthew (Kathleen) Smith, grandfather of Reed and Noah on March 26, 2019 in GA.
James Lopez, father of James (Yvonne) Lopez, on March 21, 2019 in Birmingham. Rose Lee Mollica, mother of Charles Mollica, Linda (Richard) Quarles and the late Mary Kay Minor, on March 20, 2019 in Birmingham. Malcolm Brown, brother of Cecile (Ed) Diehl, on March 18, 2019, in New Orleans. William Muldowney, father of Ken (Teresa) Muldowney, grandfather of Kimberly, Michelle and Nicole, on March 11, 2019 in New York. Samuel Alfano, Sr., son of Carmelina Alfano, father of Katrina (Joey) Fjelstad, brother of Frank (Toni) Alfano, Rita (Richard) Caldwell, Marian (Otto) Buttiker, Rosemary Alfano, grandfather of Sam, Jr. on March 6, 2019. Visitation at Prince of Peace on March 13 from 9:15am-10:30am, Rosary at 10:30am, funeral Mass at 11am. Bill Cutcliffe, father of Jan Elliott and Joyce Appelbaum, on March 2, 2019. Visitation on March 6, 2019 from 5 to 7 pm at Ridout's Trussville Chapel. 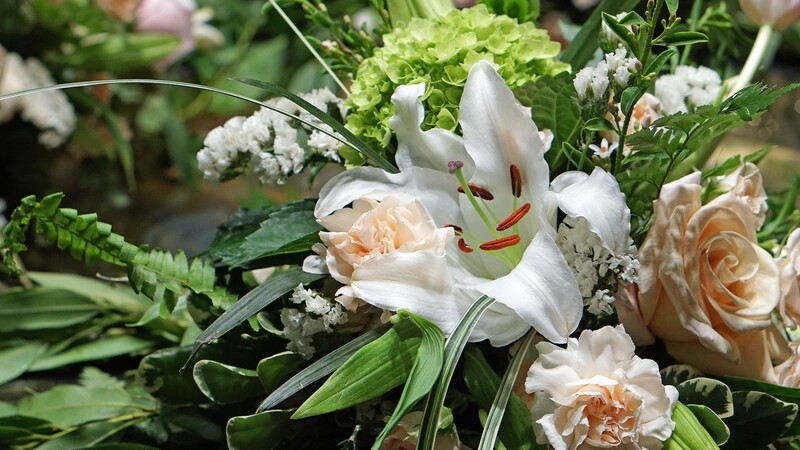 Rosary on March 7, 2019 at 10:30am followed by funeral Mass at 11 am at Our Lady of Lourdes Catholic Church in Roebuck. Deborah S. Hauer, sister of Dave (Lucinda) Hauer, in Blytheville, AR. Carol Scott, mother-in-law of Steve Lewis, on March 1, 2019 in St. Louis, MO. Joe O'Brien, brother of Eileen Richard, on February 28, 2019. Visitation at Prince of Peace on March 6, 2019 from 10-11am, funeral Mass follows at 11 am. Frances Borland, parishioner on February 12, 2019. Jason Scoggins, husband of Denise, father of Mary Eloise on February 6, 2019. Visitation at Prince of Peace February 11 from 6-7pm, funeral Mass follows at 7pm. Marcelline (Marci) Saffran Poole, wife of Jim Poole, mother of Jim Poole (Cheri), grandmother of James Poole and Melissa (Andrew) Whitfield, great-grandmother of Caleb, Elijah and Zachary Whitfield on February 2, 2019. Visitation at Prince of Peace February 6 from 10-11am, funeral Mass follows at 11 am. William (Bill) Steele, husband of Diane on January 10, 2019. Funeral Mass at Prince of Peace January 12 at 11am. Visitation at Prince of Peace10-11am. Diane Foley of St. Peter the Apostle (Hoover). Funeral Mass at Prince of Peace January 11. Visitation 10:30am-11am. Marie Heintz , mother of Gayle (Ron) Espenan, grandmother of Emily (Nick)Tsikalas and Greg Espenan on December 24, 2018, in New Orleans. Claude Furnish, husband of Diane Furnish, on December 23, 2018. Funeral Mass December 29 at 7:30pm. Visitation at 6:30 pm. Fallon Kesterson, cousin of Zac Kesterson, on December 22, 2018. Donna Lyons, sister-in-law of Delores Nicholson (Wayne), on December 16, 2018, in Oviedo, Florida. Mary Vogen-Riffle, mother of Isabella Riffle, on December 4, 2018. Funeral Mass January 4, 2019 at 5 pm. Rusty Caranto, husband of Jill Caranto, on December 2, 2018. Funeral Mass December 6 at noon. Alodia Kolody, mother of Debbie Javorka, on December 4, 2018 in Chicago, IL. Betty Booth, mother of parishioner Elizabeth Thornton, on November 26, 2018. Funeral Mass December 1 at 10am. Visitation at 9 am. Virginia Audia, grandmother of parishioner Heidi Bodin, on November 25, 2018. Funeral Mass November 29 at 6pm. Visitation at 5:30pm.